New Travel Grant Program and Increase in Prize Money Announced for 2017 US Dressage Finals Presented By Adequan® – Prize List Now Available! 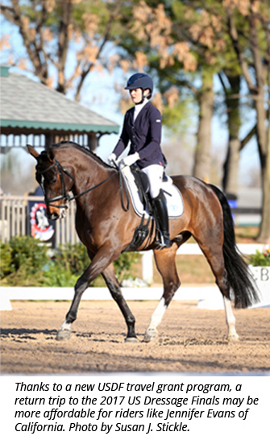 For Jennifer “Joey” Evans of San Francisco, Calif., last fall’s journey across the country to compete in the US Dressage Finals presented by Adequan® with her Dutch Warmblood gelding Bombay Sapphire in the First Level Adult Amateur Championship division was the trip of a lifetime. Now the United States Dressage Federation (USDF) announces a new travel grant program for qualified competitors representing certain states in the Western United States, which may help riders like Evans realize their dream of competing in Kentucky again in the future. To alleviate some of the financial burden for those traveling the greatest distance to the 2017 Finals, the USDF is making up to $50,000 in travel grant funds available to eligible competitors who apply and fall into one of two groups based on the rider’s address of record as associated with their USDF membership. Competitors from Group 1 (which includes Washington, Oregon, California, Hawaii, Alaska, Montana, Idaho, Arizona, Nevada and Utah) are eligible to apply for grants of up to $1,200 per horse/rider combination, while competitors from Group 2 (Wyoming, New Mexico, and Colorado) are eligible to apply for grants of up to $900. “I think this is great news for West Coast riders – my trainer and I are always telling fellow riders what an incredible experience the Finals was last year,” said Evans. “I would love to go back every time if I were to qualify again, but the reality is that it was such an expensive trip out that I cannot justify the cost year after year. We have some very talented riders out here who would love to go to Kentucky, but I know first-hand that the logistics and expense of making the trip can be discouraging. This new travel grant program announcement comes on the heels of an increase in USDF’s overall support of the US Dressage Finals, which will be held November 9-12, 2017 in Lexington: prize money for the main event will see an exciting increase to $75,000 this year, as well as a total of over $180,000 in prize money now being offered for the 2017 Great American Insurance Group/USDF Regional Championships, which serve as qualifying competitions for the Finals. Excitement for this year’s event is now officially underway as USDF has also released the official prize list for the 2017 US Dressage Finals presented by Adequan®. To learn more about the Finals, download the 2017 prize list, and sign up to receive news and updates, visit the official event website at www.usdressagefinals.com. This entry was posted in FEI & USEF Dressage News on June 25, 2017 by ludlumfarms.